The small intestine (or bowel) is compressed into numerous folds and occupies a large proportion of the abdominal cavity. The duodenum is the proximal C-shaped section that curves around the head of the pancreas. 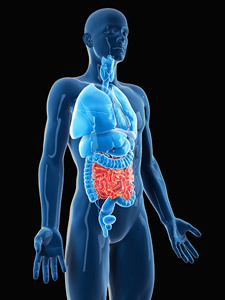 The small intestine performs the majority of digestion and absorption of nutrients. Partly digested food from the stomach is further broken down by enzymes from the pancreas and bile salts from the liver and gallbladder. After further digestion, food constituents such as proteins, fats, and carbohydrates are broken down to small building blocks and absorbed into the body’s blood stream.